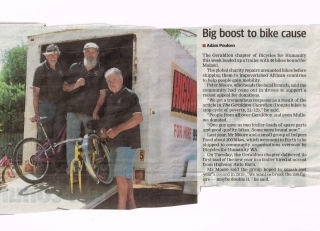 Just sending you all our latest news paper article re the Bicycles 4 Humanity project in our back yard in Geraldton. We had just packed the last of 200 pushbikes we had reconditioned and sent to Perth for on forwarding to Africa via our HQ in Perth. 100 last year. Thanks to all the chaps who have made this year a great success. Arch Fraser, John Turner, Ian Johnston, Douglas Bruce, Declan 8 yrs old, Bruce Ralph, Chris Neretlis, Eddy, Mal, Terry Baker, Peter Lindaman (Canberra) Guy Sullivan and Rotary Club of Geraldton Greenough. There is many others. People who donated bikes. Unfortunatly not long after this photo was taken I was rushed off to Emergence ward in Geraldton and flown to Perth via RFDS where I spent almost 2 weeks in Hospital with a torn Aiorta. I almost pegged out only for Linda King and everyone else concerned. Hopefully I will be operated on in Perth to repair 4 anuarisms. About May. PS B4H is still in operation thanks to the Chaps.